On the 7thSeptember 2018, industry analyst Karsten Weide (@KarstenW) at IDC published a market share report titled Worldwide Digital Advertising Software Market Shares, 2017: Despite Intense M&A Activity, Ad Tech Still a Fragmented Market (7-Sep-2017, DOC #US44240218). Criteo is the market share leader. Please fill in the form to get the report. 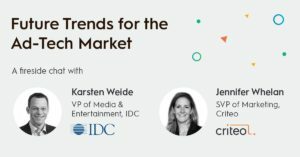 See also our blog post on this report or check the fireside conversation between Karsten Weide / Programme Vice President Media & Entertainment, IDC and Jen Whelan / SVP Marketing, Criteo on future trends for AdTech.